Not to be confused with Al Brown's Federal Delicatessen, which I have wanted to blog about since the day it opened (but somehow never got around to), Al's Deli is an independent eatery founded by Canadian chef Aleks Lazic. Born in Montreal to a family of European immigrants, Aleks has travelled the world cooking at prestigious venues, before settling in New Zealand and deciding to reconnect with his home town through serving its most famous foods at his own restaurant, from handmade Montreal-style bagels to the calorie-laden poutine, which many consider to be the national dish of Canada. Al's Deli is larger than you might think. Although the deli only opened in late November, the food there has already been requested by Leonard Cohen, and a Montrealer apparently claimed the smoked brisket was as good as that of Schwartz's deli in Montreal. Most of the ingredients are made in-house, from cronuts to cheese curds, to maple and cherry smoked bacon, smoked brisket, and Sicilian sausages, to of course, the handmade bagels, baked fresh daily, including gluten-free ones. Situated on a steep road off Queen Street, the entrance to the deli is actually at ground level on City Road, although most of the restaurant lies above a Korean BBQ buffet restaurant. There is a good view towards the city centre from the little balcony, and the owner has also done a great job of fitting out the place, with naked lightbulbs here, round lampshades there, mismatched retro chairs, authentic deli style sauce bottles, and even a set of what looks like airline chairs. Retro chairs, sauce bottles and more complete the picture. Most of the menu items contain bagels, even if they are not explicitly mentioned. Want a sandwich? It's in a bagel. How about a salad? Bagel chips. If the chef's special is "Fresh panko-crumbed tarakihi, home made tartare sauce, watercress", then guess what, it comes in a bagel. The exceptions to this seem to be the poutine and BBQ Ribs. Now, I don't have anything against bagels—in fact I like them a lot—but I am not really a connoisseur of them. So I can't give any commentary as to whether the ones at Al's Deli are better than those at Best Ugly. They do look and taste pretty similar, though they might be a bit firmer, and are also around the same size—one bagel seems too small for lunch, while two is too much. I know I shouldn't be judging on the packaging, but I love the paper wrapper emblazoned with the Al's Deli logo when you get your bagel sandwich to take away. Takeaway bagel wrapped in custom-designed paper. While one bagel isn't quite enough for a meal, the brunch options at the deli are large enough to sustain you through a Canadian winter. We were basically forced to take the accompanying bagel away when we ordered the brisket hash. The smoky beef, beautifully browned potatoes and perfectly poached eggs were more than enough to fill up on. Brisket hash, poached eggs, hollandaise and watercress. Likewise, I am not sure if our order of a small poutine can really be classified as small. This came with soft cheese curds and a beefy gravy. Although we have never eaten poutine in Canada, we have no doubt this is a fine example of the dish (even though it is not something we would eat often). Poutine with hand-cut fries, homemade cheese curds and gravy. All in all, Al's Deli is a great place to visit. Convenient location, great atmosphere, tasty food prepared by a passionate chef, open 7 days, and not too expensive... what else could you ask for? Plus they seem to be the only eatery around with "moose ears" and a selection of Canadian beers. Already a favourite of ours! If you are not that hungry, then bagels are the obvious choice. Anything with their smoked brisket is great, and their poached eggs are just right. And though I hesitate to recommend poutine except as a novelty, you can't really go to a Canadian restaurant without ordering one at least once. You actually have a bunch of options here, from bagels filled with avocado and/or cream cheese, to eggs benedict, to haloumi salad. And desserts are vegetarian too of course, including the moose ears, cronuts and any specials such as the salted apple pie fries currently on offer. 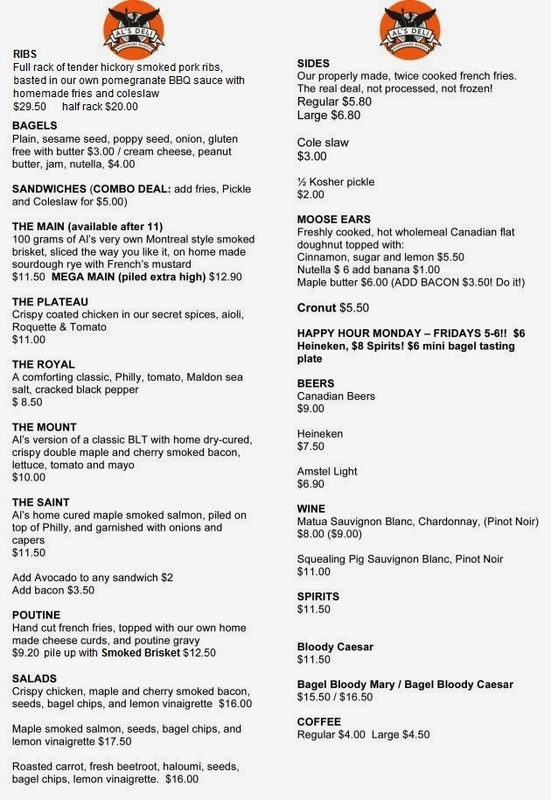 Bagels, poutine, salads, sides and drinks menu. The entrance to Al's Deli is on City Road. I had poutine from The Fed's stall at Big Day Out, for the first time, a couple of days ago which looked exactly like your picture. I heard that the authentic versions are swimming in gravy that you can't even see the fries! Those bagels do look lovely though - I must wander down for lunch one day! This was quite similar to the one from The Fed, which is why I assumed they were meant to be that way. People disagree on what a perfect poutine is though. The Poutine Pundit says the fries should be crispy on the outside, and the gravy should not be too hot (otherwise the chips would go soggy), while a BuzzFeed contributer says the gravy should be super hot, "hot enough to melt the cheese curds and make the fries soggy". I guess if you have the fries swimming in gravy, then you are guaranteed to have the soggy version! Oo, this sounds like an interesting place to try! It's quite close to my husband's work and we didn't even know it was there! Their menu has grown a little since I posted this, with Angus sirloin steak in spices as well as a selection of cocktails such as watermelon mojito. Hope you enjoy! I guess that's the price you pay for handmade goodness. And unlike a supermarket-bought bagel, you get to sit down and have it toasted and brought out to you. 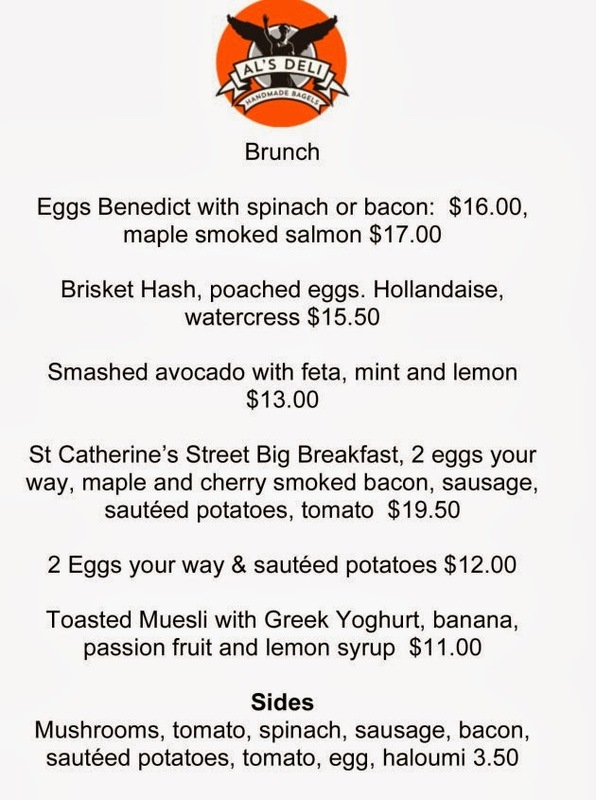 The brunch options are no worse than most cafes, I thought, maybe even better value than most. Yeah just that I'm a bit eeeeeksss when I see cafe foods cos prob for me I unconsciously imagining the mark ups, hahah. Where are all my reviews?